Hi all! As SLPs, we specialize in communication skills and what we communicate to the world matters. Unfortunately in current news/social media, kindness is often overshadowed by negativity but in my minuscule corner of this Earth, I choose kind. I am not looking to produce ratings, I am looking make a difference. 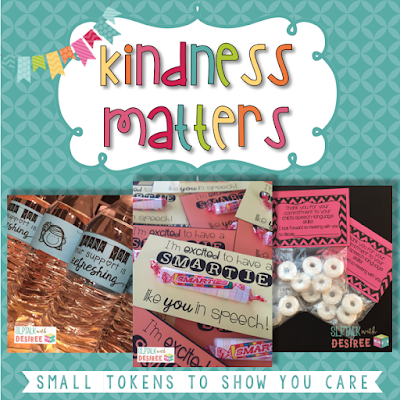 So today I wanted to share with you some little tokens I incorporate into my practice that as well as celebrate some acts of kindness that have been bestowed upon me and my precious littles recently. I hope that you find these simple gestures refreshing (sorry, I can't resist the opportunity for a play on words). 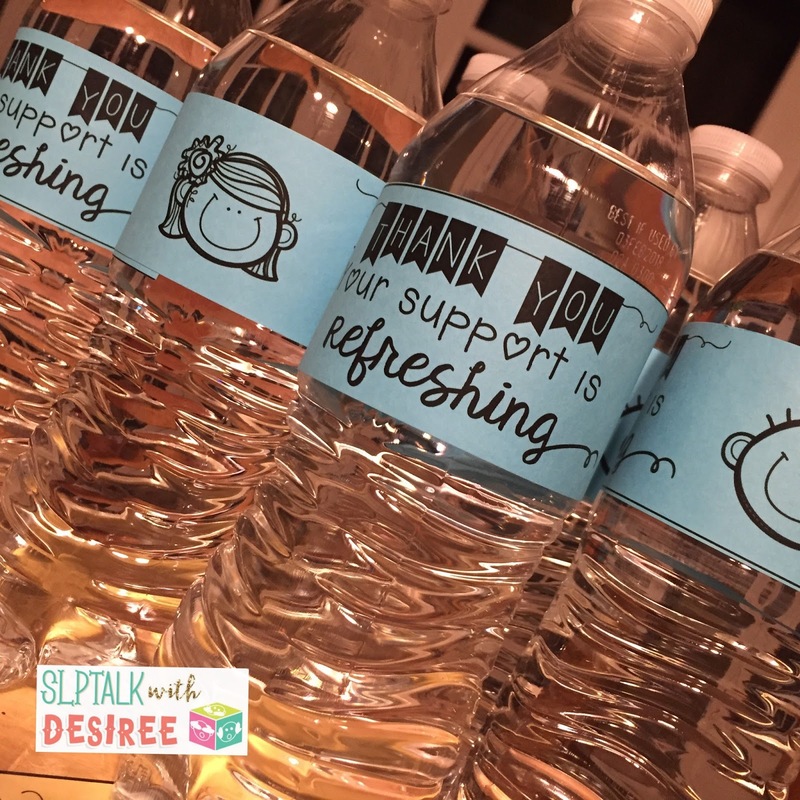 I place these water bottle wrappers on water bottles in the conference room to welcome parents and staff as we discuss their students. It is a simple gesture really and one that does not break the bank at a little over $3 for a 32 count pack of water bottles. 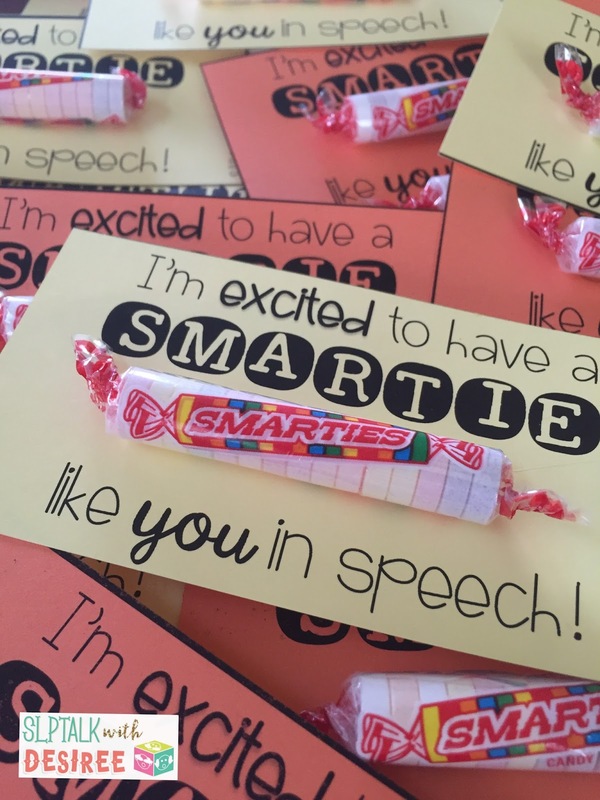 Having my little smarties in speech is the reason I show up at work every day. 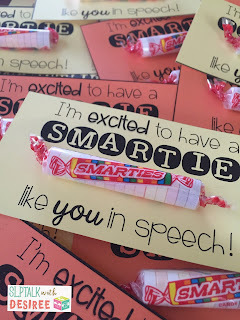 These small tokens invite my students into my speech room on Open House in the beginning of the year and are a warm thank you to have on hand when a student returns a paper from home with a precious signature from their parent. 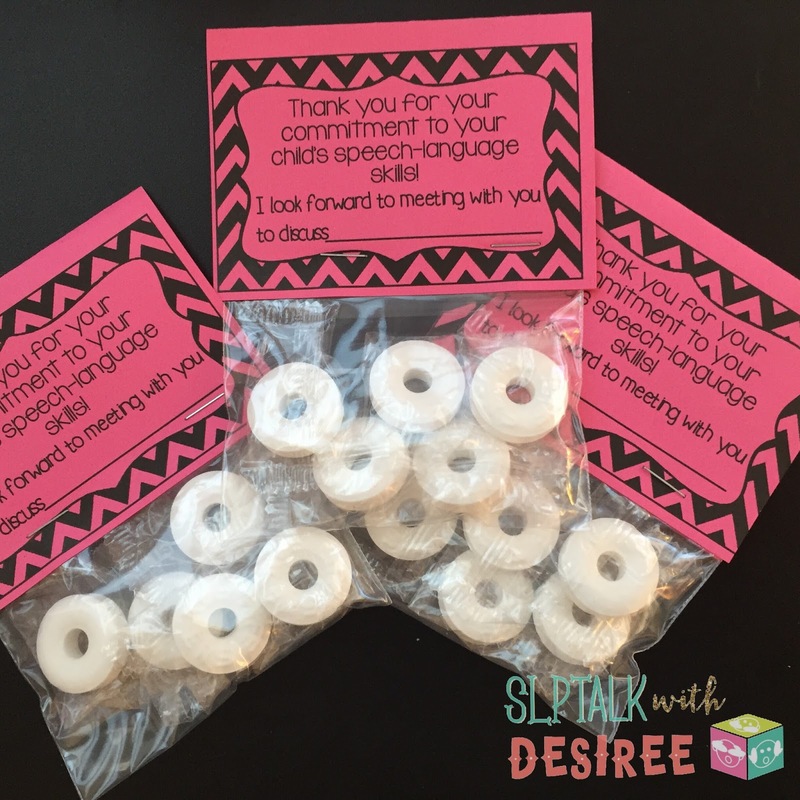 I do not give out candy on a regular basis so these sweet treats are a pleasant surprise. These labels are available to Print and Go (no color ink required) as a freebie here. Last week, I received a sweet, sweet card in my mailbox from an administrator at the Board that made my day. Knowing that this person had taken time out of their busy day to perform such a kind gesture meant so very much. Call me old school, but there is something about getting a handwritten card in the mail that is unrivaled by an email or text. I suppose it is akin to my love of printed books. I will cherish it along with my collection of other written notes from parents and students for years to come. Challenge yourself to pay forward those seemingly simple acts with sending a kind note someone's way. This past weekend, my own son was the recipient of the ultimate act of kindness: time. These two amazing teachers Mrs. Garwood and Mrs. Carpenter jumped on the opportunity to see three of their past and present students shine by cheering them on at their ice hockey game. My son was excited beyond belief when he came home from school and told me that they were coming. It was all he could talk about. For those who know him, you may know that he is a shining example of what I strive to be. He was born with an omphalocele, has fought through Lyme's Disease and defies expectations at every opportunity. The boy bleeds GRIT and determination. He works HARD at school and does not shy away from a difficult task. On the ice, he is in his element and truly shines with ease. I am beyond thankful that he has the support of these remarkable educators that shine at what they do. I'd love to hear what acts of kindness you can pay forward. What ideas do you have? Please let me know in the comments below to inspire myself and others!